Richie Carmichael released ArcGIS Diagrammer 9.2 (beta) and it is very impressive. I’ve used Geodatabase Diagrammer in the past with Visio to create such graphics, but this new ArcGIS Diagrammer will simplify the process. ArcGIS Diagrammer is a visual editor for ESRI’s Xml Workspace Document that is created out of ArcCatalog. 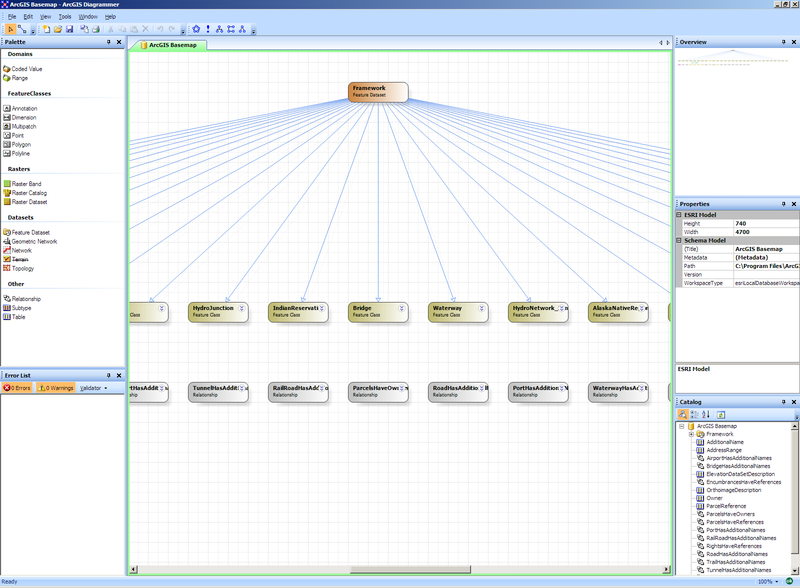 You can graphically manipulate the geodatabase schema in a GUI application that is best described as a cross between Visual Studio 2005 and Visio. I tried to load up the whole schema for SDSFIE 2.5, but alas I didn’t have enough memory (or patience) on my laptop to let it complete. Simple geodatabases though are a breeze to edit and analyze. Anyone who manages data with the ESRI Geodatabase will want to check this tool out.